Every time I see Brittany eating or whipping up fresh spring rolls, I think, “Damn, I need to make those”, because they look so tasty and fresh. I finally pulled out my favourite Asian cookbook, checked out a few recipes, and realized the only thing I was missing was the rice paper wrappers. Well, I remedied that this weekend, and tonight I finally got rollin’! The lime zest and sweet chili sauce were actually suggested by the recipe in my cookbook, so I figured they had to be good additions. As you can see, my wrapping skill needs work – they aren’t quite as tightly rolled as they should be. But they still look pretty awesome! 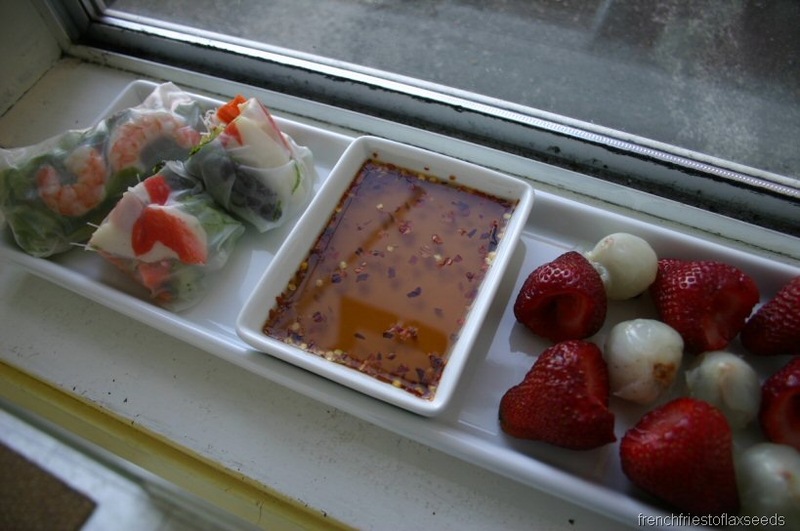 I also had some strawberries and eyeballs lychees along side the two spring rolls. And I made the dipping sauce from my cookbook as well, since it was so easy – it’s a Thai fish sauce based sauce. Nice and light. Okay, why have I take so long to make fresh spring rolls? Seriously. I enjoyed this meal so much! Perfect dinner on a hot night like tonight. And the lime zest/sweet chili sauce in the rolls was excellent. You only need to add the tiniest bit, but it adds so much to the roll. I think these might be one of my new obsessions – sure, it involves a little prep time to chop all the stuff up, but that’s minor. After dinner, I went for a walk. It must have still been at least 25 C out there. But it was nice to just be outside, instead of in the stuffy gym. Then it was time to clean up the mess I made in the kitchen, and watch some Canada’s Next Top Model. By then, the after eating stomach pain had subsided, so what did I do? Eat more, of course! 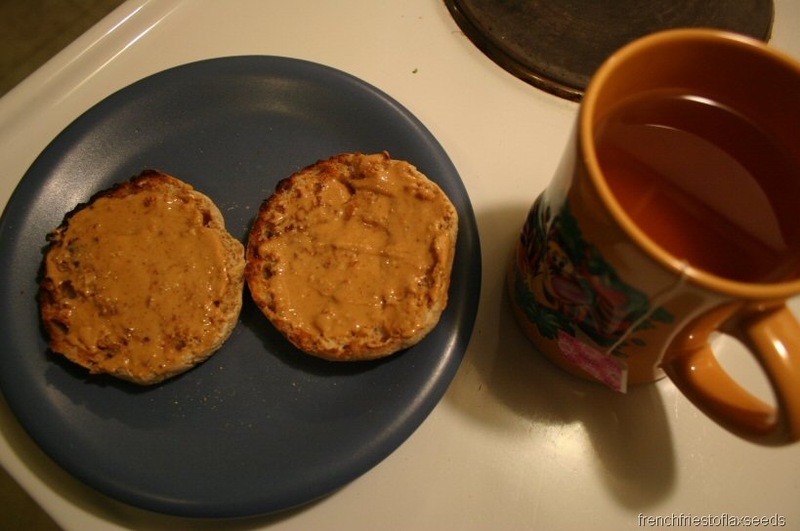 Whole wheat English muffin, toasted, with peanut butter. And a Tigger mug of raspberry white tea. And then, the pain came back. Although, not as bad, which is either due to quantity of food, or the tea. Alas, I don’t think there is any food that doesn’t cause pain. Le sigh. Now it’s time to watch some news and get some zzzz’s. Night! I’m so glad you tried the spring rolls. 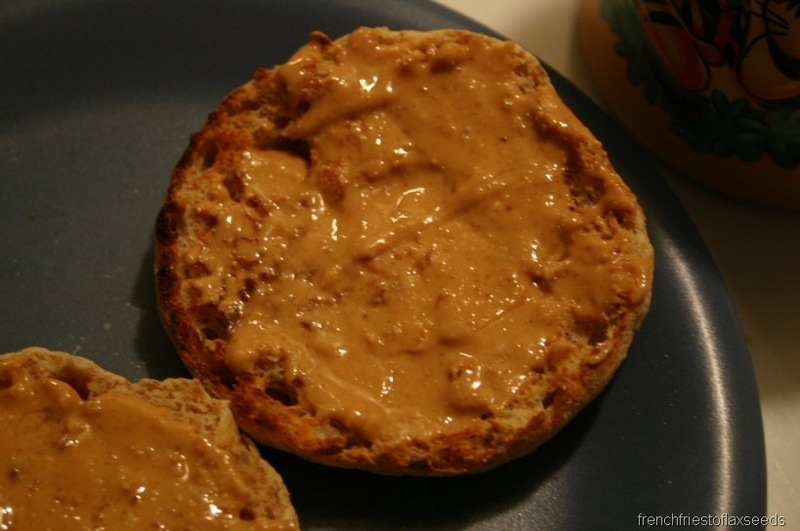 Once I make them I get addicted for a little while and want to have them all the time…. they’re just so easy and tasty. What more can you ask for? Well, besides not stomach pain!! Sorry your tummy is hurting after everything you eat- definitely no fun! The spring rolls look delicious! What cookbook did you use? Thanks! Your rolls look awesome!! I wish I had the patience to make things like that. I know it probably doesn’t take much but I just love throwing stuff on a plate and eating, haha! GREAT shrimp rolls! Those are always a fave of mine when we eat Thai! 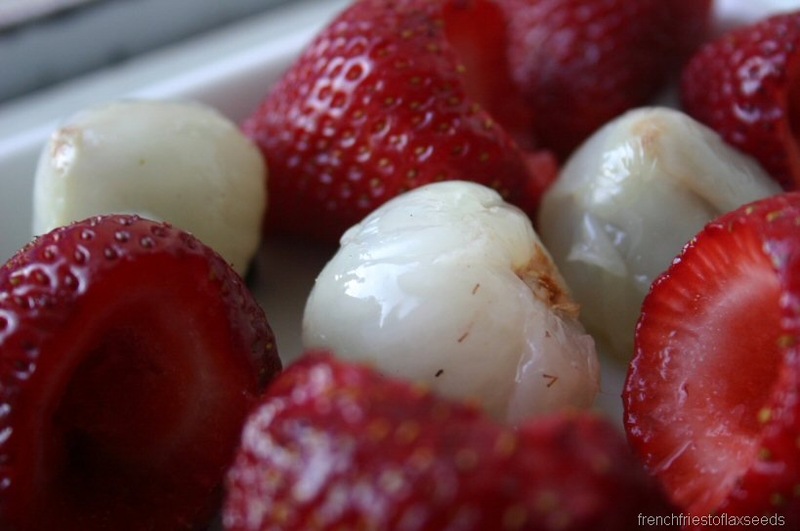 How do youu peel those lychees nuts???? Those spring rolls look great! I need to get some of that rice paper. Did you find it in a regular grocery store? 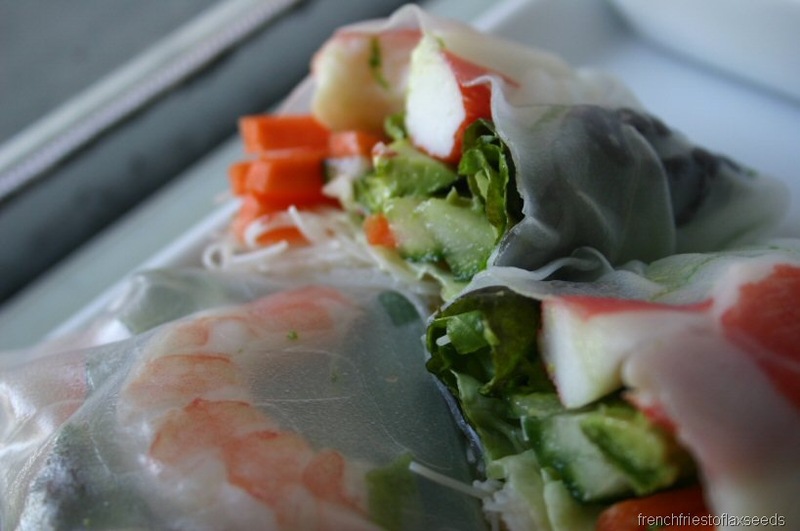 Thanks so much for sharing the spring roll recipe I been wanting to make some but not sure how! 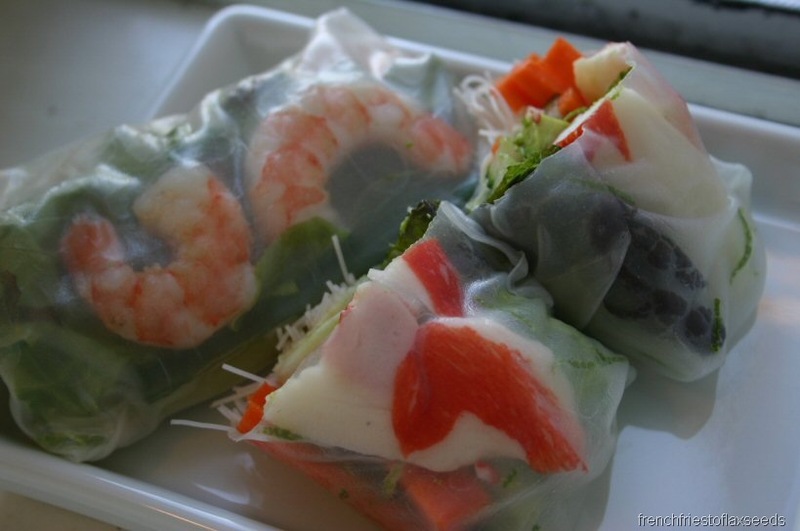 You know in Hawaii the Viet resturants call them summer roll hmm.